Firestone Development submitted a demolition notice for the building, which it wants to replace with a five-story apartment block, and the deadline for Sheffield Council to make its ruling falls next Tuesday, April 16. Campaigners who have fought to save the 1913 building on Nursery Street, beside the River Don, close to the Wicker, fear the worst. A decision will be made under delegated powers by a council officer, and because the building is not listed or within a conservation area, there are limited grounds on which the council can object. Green Party councillor Douglas Johnson, who opposes the planned demolition, blames the building’s likely loss on the council’s failure to press ahead with plans for a new Castlegate conservation area or approve his request for an article 4 direction which would have offered similar protection. 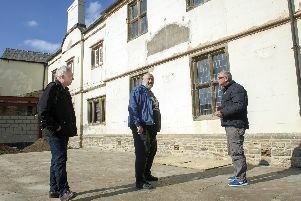 “The council’s really bending over backwards to do what big developers want, and it seems quite happy to lose some really interesting aspects of the city’s heritage,” he said. “Its deliberate refusal to have a policy, effectively abandoning the conservation area proposals and failing to make a decision on article 4, shows a lack of backbone which really frustrates people. Firestone first submitted a demolition notice last year, only to withdraw it in the face of public opposition. The developer submitted the new notice last month, claiming it had failed to find a financially viable option to retain the building which satisfied the council’s planning officers. Firestone, which intends to begin demolition on July 1 and estimates it will take 12 weeks to complete, states in the new notice that the fire-damaged building is ‘progressively getting unsafe with constant break-ins and unlawful use’. The developer has yet to submit plans for the new apartment block, which it claims would add ‘vibrancy’ to the area. Consultation on proposals for a new Castlegate conservation area, incorporating Nursery Street, was due to begin earlier this year before being cancelled at the last minute. Councillor Mazher Iqbal, the council’s cabinet member for business and investment, said he was not happy with the work undertaken so far and wanted more time to ensure the policy was ‘balanced’, taking into account the demands of both conservation groups and developers. The Star has approached Sheffield Council for a comment.